Going after an phenomenon similar to that at Grand Prismatic Spring, but with a pitted volcanic rock rather than the soil at Yellowstone. A view of the Grand Prismatic Spring in Wyoming from the sky! Makes for a good render. One of my favorites! At least one of my laptops has sported this backdrop since you released it. I'm glad you enjoy this render! Hope you don't mind that I tried to "improve" on it. Somehow this pops off my monitor into real 3-D. It's the most striking image on the whole website. Love it! It's 2013, and this is still my all time favorite. I keep coming back to it. The 1152 x 864 version of prismaticpool1 is missing. The 960x800 (EVO, Incredible, N1) file is corrupted. Only a partial file is available in both the Members Only download area (Members Mobile Wallpapers) and also in the 960x800 .zip file version for the EVO, Incredible, N1. The watermark is missing from the 1280x800 render. I saw the similar pool in National Geographic talking about Volcanic in Greenland. "I see that there are what appears to be some deliberate figures around the orange fringe of the pool. Some of these are red, some are not. Some look like they could be people, or birds, or some other creature. Is there something there, or is it the happy coincidence from the act of digital creation?" "What are the figures in teh orange fringe?" "still holding my breath for multiscreen renders"
I think this one is a gem. This is the first wallpaper that I've felt moved to comment about. Absolutely desperate for the multiscreen versions (as are a surprisingly large number of others, going by the comments here). Maybe just the 7680x1600 so we can resample it down? It certainly does deserve a much higher rating. It's a very fine piece of digital art. The rating isn't a compilation of all three versions, is it? By the way, what's the ETA on the dual screens? Last update was Sept. 21; tomorrow it will be November. I know you're busy, Ryan -- maybe after the next image goes up? Oh pleeease? Steve D says, "This deserves so much more than a 7.2! It is easily in the top 3 for the year so far for me." looks like a nasa photo of an old meteor strike. This deserves so much more than a 7.2! It is easily in the top 3 for the year so far for me. "Oh, the re-do is much better!!" could you post without the wildlife? I have a Samsung Rogue phone (brand new phone that just came out), and the screen resolution is 400x800. Would it be possible to start providing that one also? I've been taking the iPone pne and resizing, but it just doesn't look right. I just picked up a brochure for the Caverns of Sonora here in Texas. 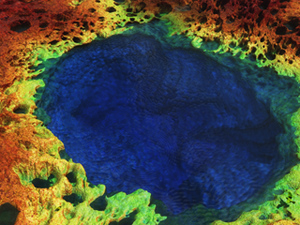 One of the photos on the brochure looks kind of like your Prismatic Pool. If you go to their website (cavernsofsonora.com) you can see the picture in the slideshow on the main page. I just came from Yellowstone. This is a pool we always vist. What a wonderful take on it. 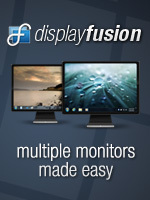 ...for dualscreens! I love the updates on this one. I would love to see a triple screen version of this. Looking forward to the multiscreen render for this one. "I've got camera pictures like this from Yellowstone." This is an awesome wallpaper, well done. And for those who say this isn't realistic, I've got pictures that say otherwise from Yellowstone. This looks very similar to Sapphire Pool in Yellowstone (see link). "This version is much improved!" I definitely like the copper tones surrounding the pool. It gives it a mystical effect, as if the water is more than what it seems. Also, the new version doesn't hurt my eyes. I like this one a lot! Much improved. Terrific work! I'm probably one of few here, but I preferred the original. Then again, I love it when you leap into flights of fancy. I love seeing you push the art form. I agree with Don, the BlackBerry Curve render is sized at 480 X 300, not 480 X 360. It's not that big of a deal because it produces black bars on the top and bottom for me, and it looks good. It would be awesome if you could update that render though, but if you can't, no biggie. Thanks again for all your work, it is truly amazing! The picklejar versions were definitely a little too "neon" for my tastes. I think you struck a perfect balance with this render though. I really like this now. Thanks for the new version! Thanks for this image , it's really beautiful ! Ryan, I think the actual dementions for the BB Curve are incorrect. When I load it, it produces a white stripe on both the top and the bottom. When I look at it compared to your last piece, this one is shaped differently. Maybe there was a mix-up somewhere. I joined for your landscapes, but this one is pretty cool too. I can appreciate the abstract but they are not normal what ends up on my desktop. This one did. I like this version a lot more because it looks so much more realistic. Really good. "Much improved - very cool!" Quite interesting now -- looks pretty photo-realistic and less abstract. I like it, dude! I liked your second one with brighter colors better, but I like the positioning of the pool better in this one. You're probably moving on to your next project, but just in case I would love a version of this darker one to be made exactly the same except with the brighter colors from the second. "Now this is a nice one"
Third time's the charm! I think this is much improved, it doesn't hurt my eyes and I can actually focus on the pool, which is actually pretty awesome. Thanks for keeping at it! And here I thought Ryan lived in Illinois. Isn't Illinois the "Land of Lincoln"? Although I guess you can still be Lord of All Iowa and LIVE in Illinois -- it's okay with me, anyway. If we're going there, how about "Lord of North America," "Lord of the World," or Lord of the Known Universe" instead? My vote is for the latter, Ryan -- I think you've earned it. Back to the matter at hand, I love the new version, even the birds. They seem very out of place, an incongruous juxtaposition of details, adding to the surreal feeling of this render. The colors are a definite improvement, too, although I loved both early versions, too. The pool color is terrific; it gives such a splendid impression of depth. Great work, Ryan -- thank you so much! tho it's seems a bit.. "dead" looking image is has some color ! maybe thats how a prismatic pool looks like.. i dunno! but Ryan i know You can do much much better! "Much better - very nice!" This new version is great. The eye can flow across the colors and the blue stands out even more. There's a great amount of depth....it's perfect, it really is. I would love to see this object in a low angle as part of an alien landscape with a few planets hovering in the background! Ever since I first saw the mesh, that has been what has called to me. "Yay, I prefer this version..."
Awesome modification, this looks fabulous. The first greener version was funky, but I like this one better as it's more realistic, like a surprise picture Yann Arthus-Bertrand may get from his helicopter flying over a volcano. Cool stuff. I liked very much the second "coloured" version, this third "dark" one could be a night version. The other one is much better and far more original looking. If you had posted this first it would look great, but now with the other one to compare it to it just looks boring. Much more realistic than the others. I liked them from a purely visual concept, but this one has the feel of reality that the others lacked. Looks like a rusty pool. A THIRD version? Wow. You're a sport, you are. What a hard worker! I feel like this is closer to the target, but I feel bad like you are compromising the intent of a "prismatic" pool! I like this version, too. Very volcanic rock-y. I lean towards the preference of a mystical pool though as opposed to a "prismatic" pool. But I'm still happy to have this wallpaper. Thank you so much for all of your hard work, Ryan. You really are awesome. Anyone else unable to us the dropdown to get the mobile sizes when using a palm pre? hi this is the first comment ive made on here i have been a fan of your "art" for a few years now all i would like to say is that i have the previous render as my desktop in 1366x768 but i feel (and im no artist by any means) that the dark earthy edges of this render just dont seem to have any life to them. the pool is still perfect and the edges are good to im not sure what im trying to say but i guess you no more about this sort of thing than i do. keep up the fantastic art. Speaking as a new subscriber, I do NOT begrudge you the extra week you worked on this image (Prismatic Pool). The clearer water and more realistic colors are definitely improvements on the earlier rendering. Thank you also for including the link to the pool in Yellowstone in your email. When I got member access, I went through your archives downloading everything I liked, and I noticed that as the years went by your quality kept going up and the number of finished ("abandoned") pieces per year kept going down. I am OK with this. In western Canada there are glacier-fed lakes of a stunning turquoise color, caused by the glacial silt suspended in the water. I saw them once on a trip going north from Seattle to Banff and Jasper NatParks in Canada. Though very pretty, such lakes have no fish in them, because they cannot breathe, the silt clogs their gills. I imagine the Yellowstone Prismatic Pool hosts nothing but bacteria, due to heavy mineral content. I hope to get to Yellowstone someday. "much easier to look at"
my eyes flow around the image a lot easier than the previous render! great improvement!! Perhaps I'm just a little bit different than everyone else. I'm usually the one nitpicking what everyone else loves but I think this one is fantastic, both the previous renders and this newer one. Good job! For me anyway, it takes a while to 'grasp' or appreciate abstracts. I don't know if there is too much 'happening' in them all at once. chaos vs. order, or what. But, your abstract work end up being what looks best on my mobile devices, I think because they cause me to halt and take a look. Something does strike me funny with the water though. It looks realllllllly artificial, and computer generated. Usually your water rendering is more realistic. Still a beautiful pic, but thought I'd throw that out there. At first I rated it a 5, and didn't like it. Upon looking at it further, I had to vote again and make it an 8 (I hope this is ok! ), because it really struck me this time what a beautiful piece this is. I promptly put it on my desktop and it looks awesome. Great work as always. To me, vs the first and second update, this one is 300% better. It doesnt strain the eyes so much with the color blending. New desktop paper now! I really did'nt think you could turn this one around but you did. It looks alot better than the first version. It's still not my favorite but I can live with it. The main problem now I think is the water color, it just clashes too much. Ah well, I look forward to see what you come up with next. I really love both your real and abstract, it was really only when you tried to mix the two that I didn't really like it. "Been following the twitter updates..."
Since I was following the twitter updates, I got to see both the first version and this one. I was so-so on the first one, but this one is definitely desktop-worthy - more so than the first. That ribbon running on the side is a road with cars on it. "funny this is being called "abstract""
i like the brighter versions better, as they look more "real". Great work as always. The water in this wallpaper is sublime. Not entirely sure if the orange, blue, green and grey work together though. I did some experimenting in Photoshop (made a new layer on top, set blend mode to color and then coloured over all the orange bits with black). This looks far better IMO. This version is kind of symbolic for me. Nice changes. Very Pretty, I love it!!! Interesting...I like the color of the water. How come the bird are that weird color of green-yellow? I love this image. I tend to enjoy the abstracts and other images like this that come close to being abstract, because I can read something more into them. In this case I find the blue pool calming in the midst of what appears to be a blasted, mineral rich rocky surface. I love how this looks! You have such an amazing eye for color, shape, and design. I'm a big fan of the abstracts that you do, and I really like this one. The colors are stunning. I like the image rendering but I think it's a little too plain. I like the birds though. I like this one, even though it's probably too garish (I mean that is a good way) for me to use as a desktop. I recognized the subject immediately, and I thik you did a nice job capturing an amazing natural occurance. Don't let the comments get you down! I really like this one. Good job Ryan. This one is very cool. I love the almost unnatural colors of the rock. One of my favorite things about your art is that you can push past the boundaries of reality, even if it's just a little bit. I can't wait to see how you make this one into a multi screen. I think this piece would do well with an animated version. I'm thinking the water droplets on an endless loop would be subtle yet impressive display. I like this one! Very bright and colorful. It really captures the imagination. Bird Camo that's pretty funny. "Well, not the newest version..."
So maybe that explains it. "Wow. I didn't even notice the birds..."
And I've had this on my desktop since yesterday morning. "and what's with the birds!?" Having seen many of these pools, my problem is the ripples on the pool. Usually, the water is hot and steaming and it is serene and you can see perfectly to the bottom of the pool. And the colors beginning to die out around the edges would add contrast and realism. I do like it though. I love almost all of your work, absolutely love it...this one just seems a little too trippy. I like it, but I don't LOVE it. Good, just not your best work, in my opinion of course. hey ryan all those people who rate this low have their own opinions, they may be critics, but all art work is good artwork. my absolute favorite is your abstract images. this one has to be a favorite of mine now just cause of the colors and the way its made to work together. "Re: your Twitter message about your abstracts"
My all time favourites are Tendrils (a triple screen version, please! ), the Comb (ditto!) Issuance (ditto! ), Latticework (ditto! ), Cilia (ditto! ), Diaphaneity, Fire and Ice, Glimeren, Mandala, Riven, the Grid, Containment, Neuronet, Cosmic Dawn, Flourescence, Gnosis, Conduit, Ephemera, Nanocyte and Nifelheim. All but... one?... of these are abstracts and they're by far my favourites. The more realistic stuff is great -- I can appreciate it -- but the colours and shapes of your abstracts are what I need behind the code in the terminals on my screen I stare at all day. 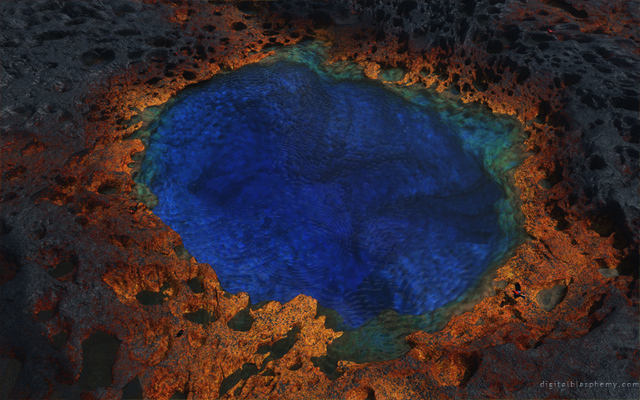 But I rate this one, Prismatic Pool, far below everything I've listed above. Please don't stop making abstracts based on response to this one. I think this one was just a bit out there. Someone above mentioned a lack of scale -- that was a problem for me on this one too. And the surface of the water just looks too computer generated to me. When i first saw the thumb nail I wasn't sure if I liked it but the detail is amazing. Didn't get to see the original but I like this one. I like the images that are close to being real with that added 'something' to take them over the edge. Like all of the extra stars in the first after glow. So there are birds in this picture? They look cool all scattered in the corners, but I would really like to see these birds in other nature scenes of yours. Perhaps in some Autumn artwork? Other than the cardinal, what are the other birds present? For some reason, I think I prefer the original. This blue, the depth, somehow falls flat. Ok, so you gan create vast panoramic views of galactic scope, or a small hot pool, deep in some dark cave. Now, I am not saying you are really ready for Godhood, but certainly you could be a minor deity of some small area... Iowa, perhaps. Yes, Lord of All Iowa. I could get behind that. An idea is too add a tint of steam coming from the waters to make it appear the water is actually"hot"
Nice ripples on the water. Nice rock texturess too. Mate,this is great. We've had the Yellowstone documentry on telly here is Aus. the last few sundays and I saw this pool last night during the doc on Yellowstones winter. Soon as I saw the thumbnail I new what your inspiration was. Would love to see more abstract work from you again. Ryan, never stop making abstracts. I'm always a fan. I like this one far better then your original, which I'll admit I didn't care for very much. However, I still feel the colors clash a little bit too much, and though the rocks on the edge of the pool are very intricate, the ones underwater could use some more detail I think. "hard to focus on it"
I do like what you have here so far, but the red on the outside is a bit overdone. That being said, I see the inside of this pool and think of the hot pools in Yellowstone, thinking, "man, that's gotta be over 400 degrees in that water!" I'm a diver - this takes me to Cozumel - the best dive I've done to date. Hey, Ryan ... is the original going to go in the pickle jar? I am really about color and my favorites are ones that showcase color. This is wonderful! I gave it a 10! Resembles a hot spring from Yellowstone National Park. Throw in some steam and large bubbles, and you'll have another hit. I love the depth of the pool, however I would like the ripples removed as they stop me from looking deeper into the picture!!! Are we gonna find out Ryan? I love most of your abstracts and I'm glad you did something like that again! This picture has really nice colors and details, but I can't find a correct perspective. (Maybe it's my strange eyes?) I don't feel looking at a pool. Although there are plenty 3D structures, it seems too two-dimensional for me, somehow... Maybe it's something with the shadows? 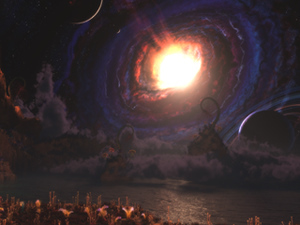 My favorite of Ryan's work is when he takes a realistic scene and adds something completely surreal to it like the beach scenes with an enormous Saturn-like planet in the background or his older space-Egyptian scenes. That's classic Digital Blasphemy to me. There just isn't a whole lot going on in an infrared pool to set the imagination going, but if you create something realistic (not like a photograph) and add something completely unbelievable to it, I find that preferable to any abstract, mathematically based or otherwise. I guess I get really critical when I'm tired, that was a rather nit-picky review. My mind doesn't think it's awkward at all of the green, and though there are a lot of ripples, They're not awkward either. I'm glad I gave it a second look, it's a very intriguing piece of art! Is it just me, or do the shadows on the top-left side of the pool resemble a diver? This is great work Ryan! Abstract or landscape... doesn't matter.... you never fail to bring it! I must say I'm disappointed at the low rating on this one, Ryan. I love your abstract work, and this is up there with the best. What's the point of digital art if you must stick only to "realism"? 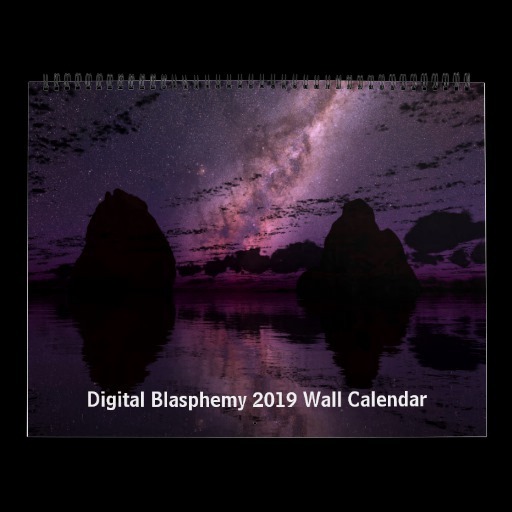 Where are the fans of digital blasphemy? If you only want realistic scenes, a camera will do as well -- better! Anyway, thank you very much for the abstract -- it seems like it's been a long time, and I'm sorry you don't have more fans of this kind of work. You shine! I like the textures used in this wallpaper and the colors are neat, but I would have much preferred that this wallpaper have a more realistic tone like a pool of water in a cave that maybe has a dim glow coming from the bottom or something, as opposed to this infrared style. Maybe a pickle jar! Add some realism to what would otherwise be an abstract and have it both ways. If it wasn't for it's association with Yellowstone, I was hoping that this wonderful piece would be titled Prismatic Perspective, where it represents the strong similarities and differences between warm colors. This automatically becomes my all-time favorite. My two favorite things in the world--DB and Yellowstone--have now been immortalized in one. You, Ryan, RULE. my first reaction was, what the hell is this? But after I set it to my background it is pretty cool! It has lots of detail and makes for a nice background, very colorful. It also looks good with invisble bars, ie. start bar and browser bars. i like all the color that shines through. Don't think it is your best work but it is interestign none the less. I dont think this pis is finished yet, I think some pickle jar color schemes might do this justice. I remember seeing the Prismatic Pool at Yellowstone when I was a kid. This is a really cool interpretation of the same idea ... I like it a lot. Digital Vomit? Help my screen has thrown up!!!! I don't like this at all, nothing you could do to change it. Move on. Love your work Ryan but this one wasn't for me. We all have different tastes though! It's unique. I really like how different it is from your other works -- it turned out VERY well! I'm very glad to have such a colourful background on my desktop. This reminds me a lot of a few hot water pools in Yellowstone National Park, except at the park, the pools had the rainbow colors underwater. When I first saw the thumbnail I thought it was some kind of abstract, possibly a fractal, but after opening the fullsize pic and seeing the depth and detail... Wow. Its a cool concept, but it looks way to digitalized and fake in my opinion. Ryan, when you're taking risks and trying new things, I'm a happy guy. I agree that this is a very colorful wallpaper, but it lacks a sense of scale and if it wasn't for the title you might wonder what exactly you're looking at. 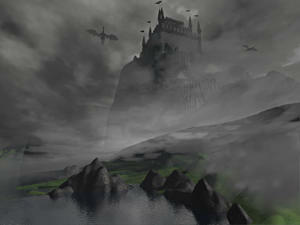 Personally I think it would work better as a more traditional landscape, what with more to the picture. Perhaps the pool in the foreground with other stuff in the background. I like the concept of this piece, however, I'm mixed on the delivery. I really like the dark reds and yellows and the blue of the water. I am not so wild about the green, however. Is it supposed to be a mosslike substance, or more like an algae, or just green colored rock? My mind can't decide what it's supposed to be. Also, the surface of the water seems to have too many ripples without sources. I personally would prefer calmer water or a visible source for the ripples, some bubbles coming to the surface or something for me to understand why the water's so disturbed. I'm not sure I like this piece as much as some of your others, but I do like where it's going. I will look at it again tomorrow with a new set of eyes and make a judgment then.